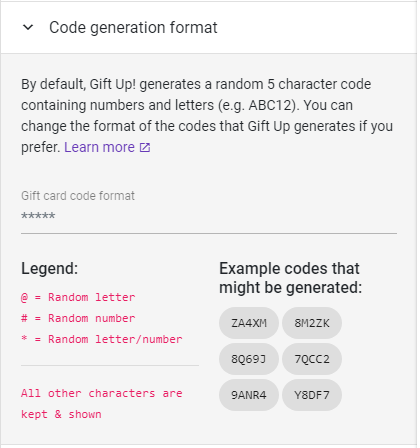 By default we generate a unique 5 character alpha-numeric code for every gift card you sell through Gift Up! Being this short and just letters & numbers, means it very easy to type in on our redeem app or for your customers if they are using it on a supported e-commerce cart. @@@@@MYCO would produce 5 letters, followed by "MYCO"
If you have an external system that can generate codes that mean something (i.e you have a Point of Sale terminal or booking system where you can pre-create discount codes of a specific value), you can upload these codes to a specific item in Gift Up! Then whenever we sell a gift card with that item, we will issue a code from the list of codes you've uploaded to us.